Growing with our community. At Century Bank & Trust, we believe that growth can be measured in the quality of life shared by friends and neighbors. While many people think that banking is only about money, we know that our investment of time and talents in a host of civic, charitable, educational, and economic development endeavors is making a difference in our area. Below are some of our recent activities. September 22nd, Century Bank hosted a Shred Day for our customers. Customers were able to bring in their papers that have been piling up and have them shredded safely and securely! Just a small way to say thank you for your business! It was a HUGE success! 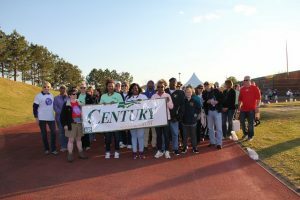 Century Bank & Trust sharing and caring for our Linemen. They have been working around the clock to get our community back to normalcy from Hurricane Irma. We Thank you! Century Bank & Trust employees contribute to fight against cancer with various fund raisers throughout the year. Our enthusiastic group raised more than $14,000 to become Baldwin County’s #1 team for the fight against cancer at Relay for Life.